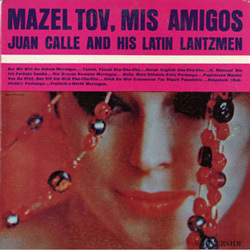 In 1961 the legendary jazz label Riverside Records released Mazeltov, Mis Amigos, an album of “Yiddish favorites in Latin tempo,” by Juan Calle and His Latin Lantzmen. The band who performed these mid-century dance floor fusions was an only-in-America supergroup that wasn’t as Jewish as their name made them sound. Juan Calle was John Cali, an Italian-American banjo picker and his Latin Lantzmen included some of the biggest names in 50s and 60s Latin music– conguero Ray Barretto, timbales guru Wilie Rodriguez, pianist Charlie Palmieri– playing alongside African-American jazz greats like Clark Terry, Doc Cheatham, and Wendell Marshall. Their album – with “Papirossen” showing up as a quick-step mambo, “Yossel, Yossel” dancing the cha-cha, and “Bei Mir Bist Du Schoen” waking up as a meringue – stands as one of the great cross-cultural mash-ups of 20th Century American pop music. This August 30th at Yoshi’s in San Francisco, the Idelsohn Society, along with bandleader Arturo O’Farrill, will recreate the album in its entirety for one night only. Like last year’s show at Lincoln Center, which drew several thousand salsa and hora dancing enthusiasts, the show will feature an amazing line up of special guest stars and a backing band that only San Francisco could provide. The show includes Fania recording giant Larry “El Judeo Maravilliso” Harlow, the brilliant Jeremiah Lockwood of The Sway Machinery, Mexican singer-songwriter Ceci Bastida, and many more. This concert would not be possible without the generous support of the Koret Foundation. Tickets will go on sale soon- follow us on Twitter and Facebook for updates so you don’t miss out!